For sixty years until 2003, most of the Isla de Vieques was closed off to the public, with the US Navy using the island's beaches and surrounding waters for drills and testing of new military machinery, such as bombs. Eschew the tourist crowds and head to La Chiva and Sun Bay. The adventure continues: kick back and relax at Caracas Beach, relax and rejuvenate at some of the top local wellness centers, look for all kinds of wild species at Wildlife Areas, and take a leisurely stroll along Mosquito Pier. For reviews, other places to visit, traveler tips, and other tourist information, go to the Isla de Vieques road trip planner . Portland, USA to Isla de Vieques is an approximately 12.5-hour combination of flight and taxi. You can also do a combination of train, bus, flight, and taxi. The time zone difference moving from Pacific Standard Time to Atlantic Standard Time is 4 hours. Expect much warmer temperatures when traveling from Portland in January; daily highs in Isla de Vieques reach 82°F and lows reach 72°F. Cap off your sightseeing on the 28th (Mon) early enough to travel to San Juan. Founded by the Spanish in 1521, San Juan is the oldest city under U.S. Kick off your visit on the 29th (Tue): enjoy breathtaking views from Yokahu Observation Tower, then get interesting insight from Tours, and then stroll the grounds of San Juan Cemetery. 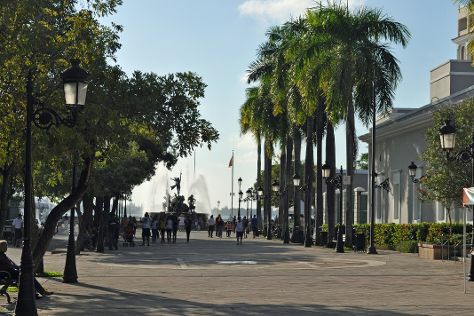 Get ready for a full day of sightseeing on the 30th (Wed): admire the landmark architecture of The Capitol of Puerto Rico, then don't miss a visit to San Juan Gate, and then appreciate the extensive heritage of Paseo de la Princesa. Plan a trip to San Juan easily and quickly by telling Inspirock to suggest an itinerary. San Juan is very close to Isla de Vieques. In January, plan for daily highs up to 84°F, and evening lows to 73°F. Wrap up your sightseeing on the 30th (Wed) early enough to travel back home.